Update [12:20 ET]: More analysis and full transcript added. What's the best way for somebody to get ahead into the middle class and to get a better paying job? It's to go to college. We know that works. And that's why the President was so forceful in rolling out something that's going to help more and more people get to college. If people work hard and get the right to go to college, get accepted, we shouldn't make it – we shouldn't impede that by saying they can't afford it. After asking if Obama could win reelection despite the bad economy, Lauer then invited Gibbs to tear down Republican presidential candidates one-by-one: "So while you've said Barack Obama has run against the perfect person so far, soon he will run against a Republican nominee. Clearly suggesting that no candidate is perfect. Take them one at a time. Mitt Romney. What are your chances against Mitt Romney, if he's the nominee?" As Gibbs proceeded to attack Romney as a flip-flopper, Lauer chimed in: "Do you think you'll have a field day against Mitt Romney?" Gibbs replied: I think that Mitt Romney is going to have a tough time explaining what Mitt Romney was for in the past and what Mitt Romney is for now." After Lauer asked about Herman Cain being the nominee, Gibbs argued: "I think if you look at what he has had to offer and quite frankly what all the Republicans have had to offer, they think a mix of more tax cuts for the wealthy and letting Wall Street write the rules....those are the very things that got us into this mess..."
MATT LAUER: Robert Gibbs served as President Obama's White House press secretary and is now an advise to the President's re-election campaign. Robert, good to see you, good morning. ROBERT GIBBS: Good morning, Matt. How are you? LAUER: I'm fine, thanks. Let's talk about those young voters. They turned out en masse in 2008 to sweep Barack Obama into the White House, in part because of the whole hope and change idea. Here we are four years later. Some of them are now second-time voters. They've graduated from college. They may be swimming in debt and they can't find a job. Why should they support him? GIBBS: Well, look, I think initiatives like the President announced yesterday are a good reason, quite frankly, for the American people to support Barack Obama, because it helps the middle class, Matt. The average person comes out of college with a $22,000 debt. In most households it's the second largest debt that they have. And we know that the unemployment rate for somebody who graduates from college is half what it is for somebody who doesn't. So let's not wait for Congress. Let's get on the side of the middle class and give these guys a chance to pay back their student loans in a way that works best for them. LAUER: Some of these young people are the same young people who are occupying parks across the country and they're out there protesting Wall Street. They're also protesting the White House. In a new report from the Congressional Budget Office this week, confirmed the rich are getting richer. Between 2005 and 2007 the top 1/5 of earners in America earned more money than the bottom 4/5. So what responsibility does President Obama have in terms of dealing with income distribution in this country? GIBBS: Well, look, Matt. What you identified and what the CBO identified is a problem that has not just happened in two or three years. It's actually happened for 30 years. That's – we've had income inequality and we are seeing now a lot of anxiety and frustration. What's the best way for somebody to get ahead into the middle class and to get a better paying job? It's to go to college. We know that works. And that's why the President was so forceful in rolling out something that's going to help more and more people get to college. If people work hard and get the right to go to college, get accepted, we shouldn't make it – we shouldn't impede that by saying they can't afford it. LAUER: You said a second ago what the President's proposing now, those are good reasons for people to re-elect him. Do you see a scenario, Robert, under which we've got something like 9% unemployment in November of 2012, gas prices are about $3.40 to $3.50 a gallon. The housing market is still in the dumps. Do you see a scenario where he gets re-elected? GIBBS: Absolutely. Because I think – and I think what's going on in this country with frustration around income and quite frankly frustration around Wall Street, look at what every one of the Republican candidates wants to roll back Wall Street reform, right? Wants to put Wall Street back in charge of writing the rules that quite frankly got us into a lot of this most current mess. Barack Obama on the other hand is out fighting for the middle class and making sure we can send our children to college. I think that's a pretty good contrast, even in a bad economy. 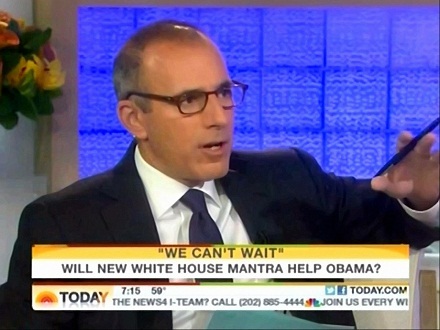 LAUER: The President has got a new slogan, "We can't wait while Congress does nothing." A lot of Republicans have coopted it already, saying "We can't wait until November of 2012." So while you've said Barack Obama has run against the perfect person so far, soon he will run against a Republican nominee. Clearly suggesting that no candidate is perfect. Take them one at a time. Mitt Romney. What are your chances against Mitt Romney if he's the nominee? GIBBS: Well, look. I think Mitt Romney has had an extraordinarily difficult week, and he's very much defined exactly what I think most people think of Mitt Romney in the six years that they've seen him on the national stage, and that is he takes a position one day and wait a couple days and he'll probably take a different position. LAUER: Do you think you'll have a field day against Mitt Romney? GIBBS: I think that Mitt Romney is going to have a tough time explaining what Mitt Romney was for in the past and what Mitt Romney is for now. LAUER: What if the nominee is Herman Cain? GIBBS: Well, you know, I think he is certainly the surprising entry right now into this field, but I think if you look at what he has had to offer and quite frankly what all the Republicans have had to offer, they think a mix of more tax cuts for the wealthy and letting Wall Street write the rules is the way to get us back on track. And I think many people in this country feel a frustration that those are the very things that got us into this mess and I think that's a recipe for how anybody is going to run against any of these Republican candidates. LAUER: Robert Gibbs joining us in the studio this morning. Robert, it's good to see you. GIBBS: Happy to be here.